So let me tell you a story about a notorious vegetable called Mr Brussel. Mr Brussel was bulky and brawny. A bad boy in the vegetable kingdom. Not many people liked him. He kind of had multiple personalities or at least was pretty moody. Some days he was bitter. Other days he was bland. But generally, most of the time he was smothered and tired and wilted and just overcooked. Bleh. Then one day Mr Brussel went to the Roasting Pan, a new pub. He had heard stories of this place changing other veggies, but he thought that it was a myth. Rumors stirred about Madame Cauli Flower and her infamous roasted makeover. So Mr Brussel decided to give it a shot. He went in. He stayed awhile. He lingered. He rested. He was massaged in some olive oil. He got braised and roasted. Then when he got out of the Roasting Pan, something amazing happened. He was sweet and delicious and caramelized. He was a changed veggie. He was the Ryan Gosling of vegetables…well, maybe not THAT far…but close. That’s it. Oh the magic of the great Roasting Pan. 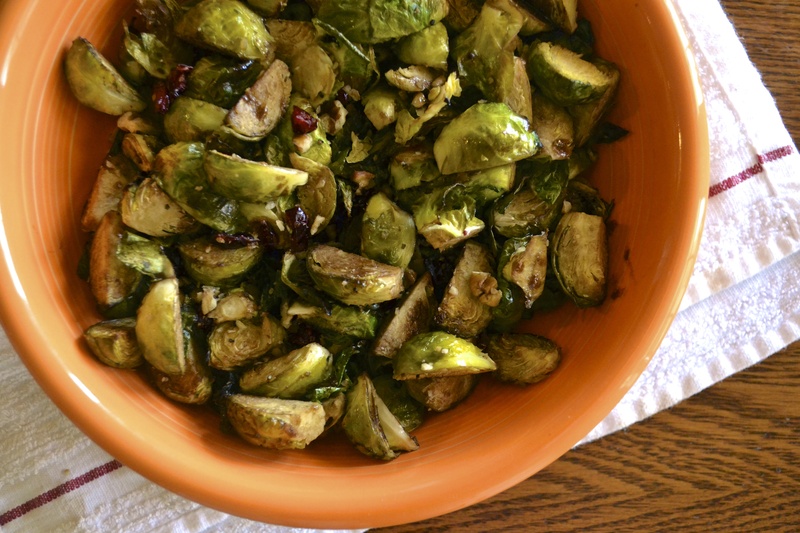 For this recipe, I tossed my roasted brussels sprouts with cranberries, pecans, and a balsamic drizzle. But don’t stop there. There are plenty of other ways to prepare these….maybe bacon? roasted garlic? parmesan? Harissa? Yes! Branch out. Give Mr Brussels another try. He won’t disappoint you. Preheat oven to 400 F. Line a roasting pan with aluminum foil. 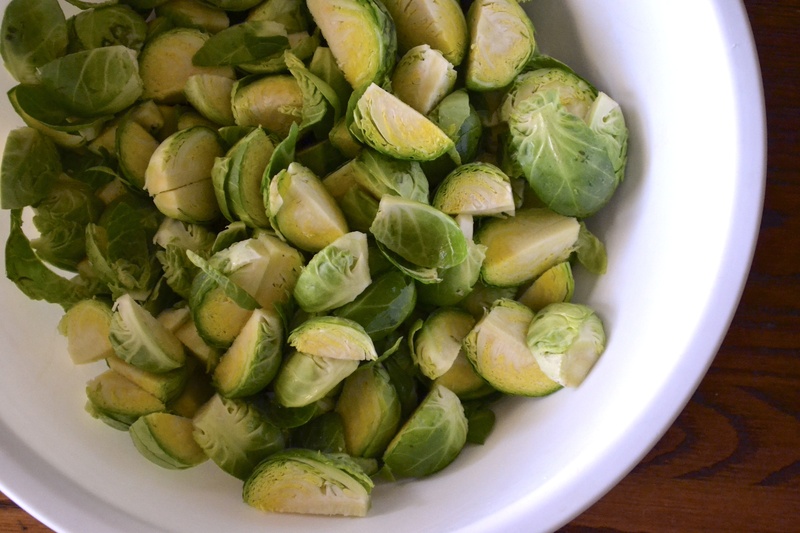 In a medium bowl, toss the brussels sprouts with olive oil, salt and pepper. 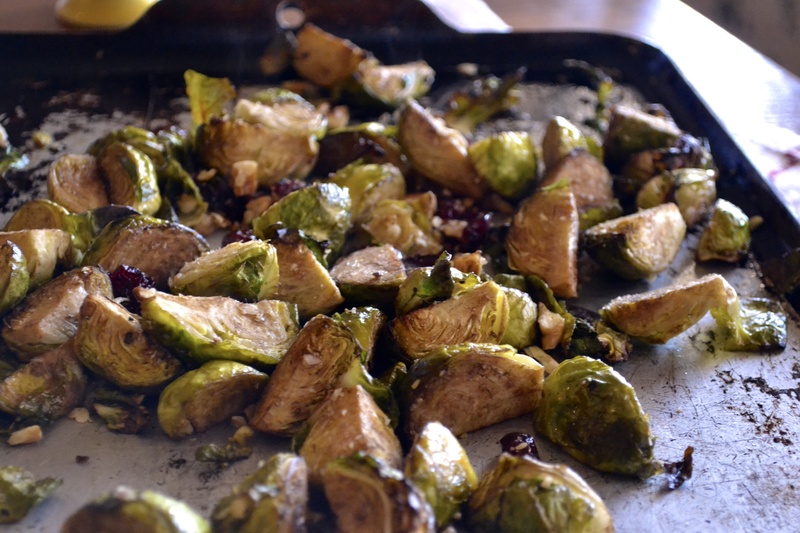 Spoon the brussels sprouts in a single layer onto the roasting pan. Roast for 30 minutes. Stir the brussels sprouts. Add the pecans and cranberries onto the roasting pan. Add the pan back into the oven and cook for an additional 5 minutes. Stir well until brussels sprouts are well cooked. Remove from oven and toss with balsamic vinegar. This post made me giggle. You are SO right about brussels sprouts. Roasted is the way to go! This post cracks me up. Ahhhhh personification! Nice job, babe. What a unique and winning combination! Can’t wait to try roasted brussel sprouts and cranberries. Thanks for the great idea. This is definitely one of my favorite fall recipes. Hope you love it.